The iconic release from Quickspin dating back to 2015 saw its relaunch in 2018, only to have its popularity grow even more the second time around. Telling the story of the mystical hidden valley Shangri-La through the characters of the two explorers and a local Sherpa, the Hidden Valley video slotis bound to provide players with a rewarding adventure. Aside from the characters, the grid is decorated by two animal symbols, an eagle and a yak – a deity in Tibetan culture, as well as the 10 to A cards decorated in a stone-like style. Players can enjoy quite a few winning possibilities considering the payout potential of each of these regular symbols, but even more so when they manage to land the Wild or the Bonus Scatter. During the base game, the Wild can appear stacked, or better yet in the form of a Wild Multiplier. This feature can be defined as a side bet, as players are given a range of multipliers on the right-hand side of the reels – choosing the range determines the bet size, with a bet on the range of x1-x2 multiplier amounts to €0.40, €0.60 for the x2 to x4 multiplier, €0.90 for the x3-x6 range and €1.20 for the x4 to x10 multiplier range. Players should be able to recognize this Wild symbol on the reels by its green background with gold framing, bearing the multiplier amount on the front. Should players land a minimum of 3 Bonus Scatters, symbolized by a Wheel, they trigger the Free Spins bonus round, situated against the backdrop of the Hidden Valley. Before entering it, players are given a chance to spin the Bonus Wheel which features an outer and inner reel. The former reel offers players the chance to win an Extra Wild symbol – any of the three character symbols acting as Extra Wilds during the free spins bonus round – which can replace all regular symbols but not the Wild Multipliers or the Bonus Scatter Wheels. The latter reel on the Bonus Wheel determines the number of free spins. Should you land two Bonus Scatters on a single spin during this round, you will be given the chance to open one of them and either win some more freebies or an Extra Wild. With a bet amount ranging from the minimum of €0.40 (for the minimum Wild Multiplier) up to €100 per spin, this 5-reel grid equipped with 40 fixed paylines can be some lucky player’s Hidden Valley, hiding in plain sight. Sponsored: Get $€21 No Deposit Casino Bonus at 21 Casino! 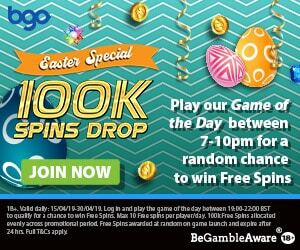 Similar Video Slots: The Legend of Shangri-La – No Deposit Casino Spins!